Trained counselors providing recovery advocacy, guidance, and care to persons in recovery over the long-term is a game changer for our field,” commented Tom Kimball, Ph.D., MAP Clinical Director. The decision to add 1,200 licensed counselors to the MAP Network is in direct response to the demands of major health insurance payers whose strategies for addiction treatment reimbursement have begun to require an enhanced form of accountability. Increasingly, payers are requiring value-driven performance from providers. Although this type of contracting has not been the norm in addiction treatment, there are many indications that that trend is on the precipice of changing. As a result of the new demands from payers, providers have begun to seriously embrace the collection of empirical data from their alumni in order to demonstrate their treatment outcomes. Further, providers are realizing that telehealth technology provides opportunities that have never before been realized. As an example, each of the counselors MAP adds to its Network will utilize MAP’s technology platform. This amalgamation of extended recovery support with predictive technology will provide the means to assess risk in patients, reduce healthcare expense and improve the quality of care. MAP’s mission is to improve the outcomes of individuals struggling with addiction. The company offers an array of services based on its data-driven technology. With at least 22 million Americans struggling with addiction, innovative strategies are essential to effectively meet this healthcare crisis. With the addition of 1,200 counselors to it Network, this is the first phase of MAP’s strategy of onboarding a diverse array of healthcare professionals. “Extending the continuum of recovery support that begins when someone enters recovery to several months post-treatment is so important to those who suffer from addiction, those who love them, and for all of our communities. Trained counselors providing recovery advocacy, guidance, and care to persons in recovery over the long-term is a game changer for our field,” commented Tom Kimball, Ph.D., MAP Clinical Director. MAP Health Management is the industry leader in the provision of comprehensive outcomes data, telehealth recovery support programs and revenue cycle management to addiction treatment providers across the country. 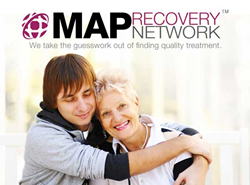 The MAP Recovery Network, The Premier Outcomes-Driven Provider Network, is comprised of quality addiction treatment providers who differentiate themselves to behavioral healthcare consumers and health insurance payers by demonstrating treatment success rates. Nationally recognized treatment facilities trust MAP to help them thrive in the evolving healthcare paradigm by utilizing innovative data-driven technologies. MAP’s dedicated teams of research analysts, clinical directors, recovery advocates, technology professionals and billing experts work to improve patient outcomes, empower treatment providers with data, reduce costs and drive facility revenue. For more information, see http://www.ThisisMAP.com and http://www.MAPNetwork.com.